Orr’s college career started at Clemson and he moved to Wake Forest before settling in at Georgia, where he made the football team as a walk-on halfback. He twice led the SEC in pass receiving and was chosen to play in the Blue-Gray All-Star Game. The Los Angeles Rams chose him in the 25th round of the NFL draft with the aim of using him as a defensive back but, after getting a shot at offensive end in a preseason game against the Steelers, drew Pittsburgh’s attention. 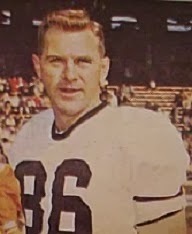 The Steelers swung a trade for Orr prior to the regular season. Steelers went 7-4-1 to finish third in the Eastern Conference while leading the NFL in passing yards (2752). It was the team’s best record since 1947. Orr followed up with 35 catches for 604 yards (17.3 avg.) and was chosen for the Pro Bowl in 1959 while also gaining first-team All-NFL recognition from The Sporting News. The numbers dropped to 29 receptions and 541 yards in ’60, but his average gain rose to 18.7 and he was still considered to be one of the NFL’s better receivers (he didn’t punt again after his second year). Orr was traded to the Baltimore Colts for 1961 and, hobbled by a series of nagging leg injuries, caught only 18 passes, but bounced back in ’62 with career highs of 55 catches, 974 yards, and 11 TDs. He continued to be a steady flanker for the Colts, again leading the NFL by averaging 21.7 yards per catch on 40 receptions in 1964 and 25.6 yards on 29 catches in ’68. In 1965 he was a consensus first-team All-NFL honoree as well as a Pro Bowl selection after catching 45 passes for 847 yards and 10 TDs. Injuries and the presence of talented younger receivers limited Orr’s effectiveness in 1967 and his last two years, 1969 and ’70. Over the course of 13 seasons, he caught 400 passes for 7914 yards (19.8 avg.) and 66 touchdowns and was twice selected to the Pro Bowl.